Trigonometric Parallax method determines distance to star by measuring its slight shift in apparent position as seen from opposite ends of Earth's orbit. The widely photographed and heavily studied Orion Nebula is nearly 300 light-years closer to Earth than previously thought, according to a new study. The finding, detailed in the Oct. 10 issue of Astrophysical Journal, also hikes up the age of the nebula's stellar inhabitants. "These stars are nearly twice as old as previously thought," said study team member Geoff Bower, an astronomer at the University of California, Berkeley. The new measurements were made using the National Science Foundation's Very Long Baseline Array (VLBA). The scientists determined the distance to a star called GMR A, one of a cluster of stars in the Orion Nebula, by measuring the slight shift in the star's apparent position while the Earth was on opposite sides of its annual orbit around the sun. This technique, called parallax, allows astronomers to measure the angle of an object's small shift in position and to calculate its distance. "This measurement is four times more precise than previous distance measurements," Bower said. 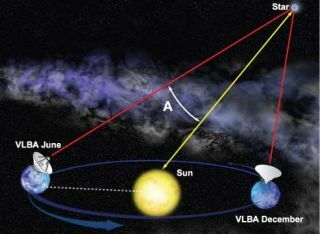 The new VLBA measurements shorten the Orion Nebula's distance from 1,565 to 1,270 light-years away. Some of stars in the nebula, for example, were thought to have formed about one million years ago. The new measurements suggest their true age is closer to two million.